Caring For a Baby with Down Syndrome - Mummy's Gone Mad! | Mummy's Gone Mad! 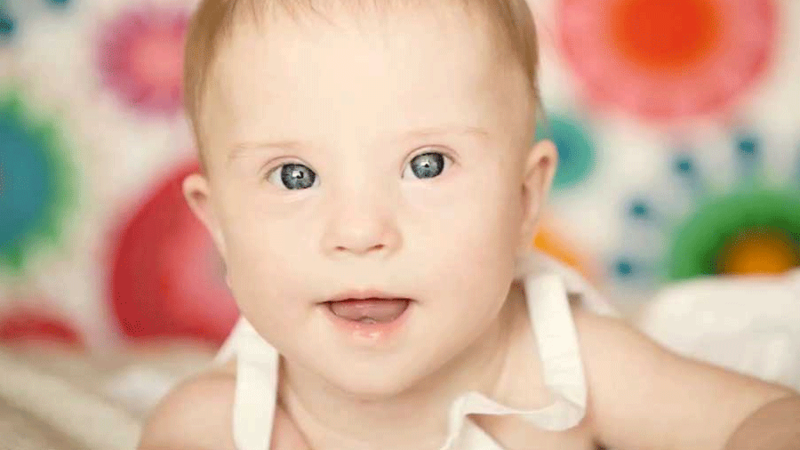 Whether you’re expecting a baby with Down syndrome or your child has already been born, you may be wondering whether your infant will need special care. Your care routine for a baby with Down syndrome may differ slightly from that of a typically developing child, but you can expect the experience to be no less rewarding. Down syndrome is a chromosomal condition wherein the baby is born with an extra copy of the 21st chromosome, which interrupts development. Children and adults with Down syndrome have distinct physical characteristics (like flat facial features, low muscle tone, an upward slant to the eyes, and small noses and ears), as well as mild to moderate intellectual disabilities. Your child’s Down syndrome may also make him or her prone to certain medical conditions, and it’s important to know what these are so that you can monitor your child’s health and report any concerns to your family physician. In addition to regular checkups, children with Down syndrome should also be screened regularly for additional conditions that they may be more prone to developing. ● Obstructive sleep apnea. Babies with Down syndrome often have an oversized tongue with poor muscle tone that tends to fall back in the mouth at night, which may cause your baby stop breathing during sleep. The AAP recommends a sleep study by age 4 for all children with Down syndrome. ● Heart defects. Your baby should have an EKG sometime in the first 3 months to determine whether a heart defect is present. Heart defects are often diagnosed in utero. ● GI problems. Babies with Down syndrome are more prone to a number of gastrointestinal conditions, including bowel obstructions and a nerve condition called Hirschsprung disease. Bowel problems are usually repaired with surgery. ● Hormonal problems. Thyroid diseases, including hypothyroidism, are common in babies and adults with Down syndrome. ● Cataracts, nearsightedness, or farsightedness. Glasses or surgery can correct these issues. ● Hearing problems. It’s important to have your child’s hearing checked regularly, especially when he or she is very young. This helps to prevent hearing problems from interfering with language development. ● Leukemia. Though leukemia is still very rare among babies and adults with Down syndrome, it does occur in a significantly higher rate (15 to 20 times higher) than in typically developing populations. Mothers of advanced maternal age (age 35 or older) are more likely to give birth to a baby with Down syndrome than a younger mother. Expectant mothers aged 35 and up may be interested in prenatal screening, which provides information on the baby’s likelihood of being born with a chromosomal abnormality. The screening is provided through your doctor’s office, and offers a way to be more prepared for the arrival of your baby. Non-invasive prenatal genetic testing, such as the tests offered by Sequenom Laboratories, pose no risk to the fetus or mother and offer a quick turnaround time (your provider will receive the results within 5 days of the sample’s receipt at the lab). The test can be performed as early as week 10 in your pregnancy. If your baby is (or will be) born with Down syndrome, know that their extra copy of chromosome 21 will not define who they are, or the opportunities they’ll have. You’ll find your child completely normal in many regards, and will develop their own personality and emotional life. As the parent of a child with Down syndrome, you’ll be able to look forward to a fulfilling parenting experience and rich family life.